Qingdao Xinguangzheng Steel Structure Co., Ltd., was founded in 1996. With the registered capital of 15.735 million RMB, covering an area of 150,000 square meters, has been specializing in designing and manufacturing steel structure building,steel structure workshop, steel structure warehouse, prefab steel structure shed, steel structure poultry house, aircraft hangar, prefabricated houses, container houses and other related steel structural products. Qingdao Xinguangzheng Group has owned more than 600 enterprise staff, which includes about 120 professionals senior engineers and builders. At the same time, we also built the skillful engineering installation and site operation teams with simplified, efficient production and management. Our company have got steel structure engineering I-grade qualification certificate in building industry, and passed ISO9001:2008 quality system certification, CE,SGS and BV Certification. We have highly precise equipment including gantry planers, automatic submergde arc welding equipment, assembling machines, slitting machines, and shot blasting machines. We have three sandwich panel production line, an annual output of 300,000 meters; eight corrugated steel sheet production line, an annual output of 1.225 million meters; five production line for H section steel with an annual output of 50,000 tons; C section steel production line six, an annual output of 4,000 tons; a Z section steel production line an annual output of 3,000 tons. The design team at Xinguangzheng is comprised of ten professional design engineers with master’s or bachelor degrees, in addition to twenty detail designers. They are able to ensure and improve our product quality through technological innovation and strict management. 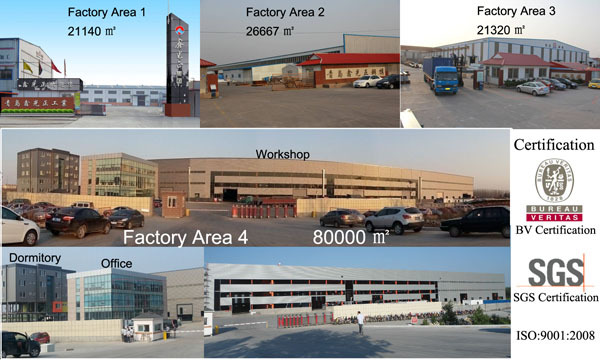 Our 21 QC inspectors with up to 30 years experience rigorously tracking each step of production to ensure high qualified steel structure building, steel structure workshop, steel structure warehouse, prefabricated house, container house to reach our customers. We have rich experience on steel plant construction, equipments supply and installation, construction and installation of steel structure for 21years. With high professional technical forces and completely related supporting facilities, concentrating on customers’ satisfaction, we provide our customers with full sets of equipment scheme project to creat steel structure integration project. With comprehensive advantages of light weight, industrialized manufcture, fast installation, shorter construction time, good performance of anti-quake design, fast investment recovery period, environment friendly, the steel structure has been reasonably and widely used in construction area all over the world, especially in the developed countries and regions. Our products have been exported to more than90countries, such as England, France ,Czech Republic,Canada, Singapore, Venezuela, Argentina, Brazil, Germany, Australia, South Africa and so on. Provided with professional equipments, skillful consulting team and completely construction scheme on steel structure integration project, you are welcomed to visit us.